Lowdown: Loch & Co return with another impossible caper operation. With two extremely good fantasy books under his belt, books that made me regard their author as some sort of a demigod, I suspect the question facing Patrick Weekes was “where to from here”. And then it occurred to him (yours truly speculates): instead of coming up with a brand new world for his next book, with all the meticulous planning that involves, maybe he should just further develop a world he had already created? Thus we have ourselves The Prophecy Con, sequel to Weekes’ stupidly highly entertaining The Palace Job, and now the self declared second episode in a trilogy dubbed Rogues of the Republic. On the plus side, we get an unplanned visit to a universe I thoroughly liked and heroes that felt like my best friends. On the negative side, a sequel is a sequel is a sequel: there’s a high likelihood for the creator to create more of the same rather than innovate on the cause of originality. Especially with this, a sequel for a book that was not designed to be sequeled. Having read The Prophecy Con, yours truly can provide assurances: The Prophecy Con is everything you’d expect to find in a sequel but it has none of the negative that give sequels a bad name. Or, in other words: Patrick Weekes has done it for the third time in a row (if I'm allowed to count Dragon Age: The Masked Empire). Proceedings start with us being quickly reintroduced to the same gang of heroes we left off in The Palace Job. You know, master thief/fighter Loch, able assistant Kail, the acrobat, the alchemist, the death/love priestess, the wizard, the unicorn, the lot. A few months following the former book, war looks like it is about to break between our heroes’ Republic and the Empire that feels threatened by events from book 1. The Empire’s starting price for peace starts with a dead Loch; for obvious reasons, Loch has a problem with that. Which triggers the Empire’s princess and her group compromising of a bodyguard and his magic axe, amongst others, to chase Loch throughout the Republic. In parallel, the Republic puts Loch on a secret quest that might resolve the brewing conflict. And in another parallel, the lesser parties of the Republic’s leadership try to rid the world of Loch. Oh, and you know what quest Loch is on this time around, in between everybody else in the world trying to kill her? It’s the exact same quest from The Palace Job. Thus we have ourselves a great setup for reacquainting ourselves with the heroes of the previous book. As I mentioned in that review, that party reminds me a lot of the character interactions in Mass Effect (a video game Patrick Weekes had co-wrote): they’re very well developed, they’re a very diversified lot, all with blatant imperfections, all with the ability to rise up to the occasion. My personal favourite? Almost goes without saying it’s Kail and his uncanny ability to always come up with beneficial references about an enemy’s mother. Because, in combat, nothing helps more than an insulting distraction. 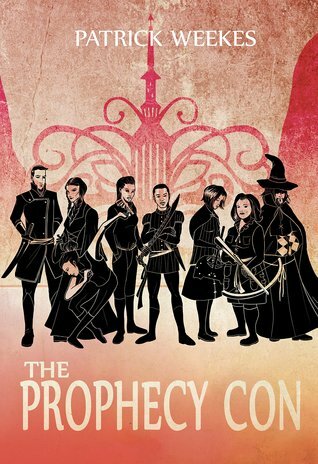 Style wise, The Prophecy Con is incredibly similar to its predecessor. Our heroes are set up against a constant build-up of odds stacking against them, but – through luck, skill and what not – always manage to get themselves off the hook at the very last minute. It is clear that this combination of build up and last minute solution is a Weekes trademark, and I have to say it works to make the book a major page turner. That said, the build up is so thorough that the solution can look too simple / unrealistic when it occurs. I guess that’s the problem with build ups for impossible caper jobs, they make one develop expectations for similarly elaborate solutions. It’s pretty much non stop action throughout, which is nice; on the other hand, one of the things I like the most about Weekes’ previous two books was the way they made me think about our very real, non fantasy world, world issues. Does Weekes manage to offer such thinking points in his sequel? My answer to this question is a “yes, but”. Yes, questions dealing with morality/ethics along the lines of what’s right for a person to do under challenging circumstances are raised and are relevant to a society infested with top level corruptness (I’m talking about our real life society now, not the book’s). It's mostly around what it means to be a good member of such a society. That said, there is certainly less of it than in book 1. Most importantly, The Prophecy Con – unlike many sandwich episodes in trilogies reviewed here before – offers an ending. It clearly sets the scene for book 3, but it does not leave the reader with their mouth open and our heroes at a cliff hangar. Weekes concluding the book after his thank you notes is a nice touch there, too. I will not deny it: I fell for The Prophecy Con through and through, enjoying every minute of it. For now I will give it *only* 4 out of 5 crabs, but I do reserve my judgement. The real question is, how well will book 3 seal the trilogy?